NOLSW members across the country are participating in local efforts to elect President Obama and candidates that support working people’s issues elected. NOLSW members have reason to be worried: Mitt Romney’s website says he will cut funding for the Legal Services Corporation, because the services that LSC provides are duplicative of services already provided by the states and other entities. In 2003, as governor of Massachusetts, Romney also vetoed state funding for civil legal services in its entirety. The Democratic-controlled legislature overrode his veto. Here are some of the Get Out The Vote (GOTV) activities that NOLSW members have participated in. 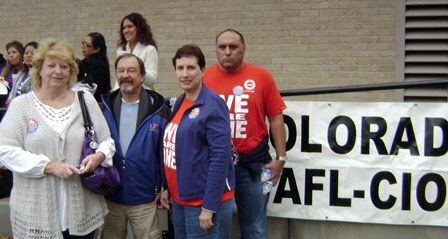 Massachusetts: NOLSW members joined labor walks in support of US Senate candidate Elizabeth Warren. They also attended a debate between candidate Elizabeth Warren for US Senate and Scott Brown. Afterwards, they had the opportunity to meet with Warren. Colorado: NOLSW members blocked walked and made phone calls in support of President Obama/Vice-President Biden and local congressional candidates. They estimated that between the four of them that they knocked on 190 doors in a three-day period. Connecticut: NOLSW members in CT walked in support of US Senate candidate Christopher Murphy. More members are expected to turn out this weekend for a UAW-sponsored labor walk in Stamford. Please send in pictures and information of any NOLSW members who participated in other Election 2012 events for union endorsed candidates who support working families' issues for publication on the NOLSW website to elainelantz@att.net.